5.2 How innovative are Spanish agri-food firms? Chapter 9: Collaborative product innovation in the food service industry. Do too many cooks really spoil the broth? 10.9 Appendix 2: assessment of small to medium-sized enterprises and large companies of the importance of Food Valley functions. Food and beverage companies are increasingly choosing to enhance internal idea development by pursuing an ‘open innovation’ approach, allowing the additional exploitation of external ideas and paths to market. 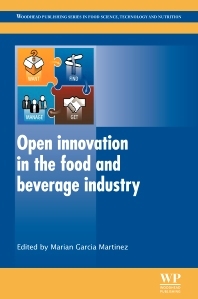 Drawing on a range of important case studies, Open innovation in the food and beverage industry investigates the challenges and opportunities afforded by the incorporation of open innovation into the food industry. Part one provides a comprehensive overview of the changing nature of innovation in the food and drink industry, acknowledging trends and considering the implications and impact of open innovation. Part two then reviews the role of partners and networks in open innovation, with collaboration, co-creation of value with consumers, the effectiveness of cluster organizations and the importance of network knowledge all discussed, before part three goes on to explore the establishment and varied management aspects of open innovation partnerships and networks. Finally, open-innovation tools, processes and managerial frameworks are the focus of part four, with discussion of the development, application and psychology of a range of initiatives. With its distinguished editor and international team of expert contributors, Open innovation in the food and beverage industry is a unique guide to the implementation and management of open innovation for all food industry professionals involved in management, research and product development, as well as academics with an interest in open innovation across all industries. Dr Marian Garcia Martinez is Director of the MSc in Value Chain Management and Senior Lecturer in Agri-Food Marketing at Kent Business School, UK. Her research focuses on NPD and innovation managements, in particular how SMEs use consumer insights to enhance their innovation performance. She has published numerous articles on the transition from closed to open innovation and the organisational and managerial challenges companies face to accommodate a more externally orientated mind-set.